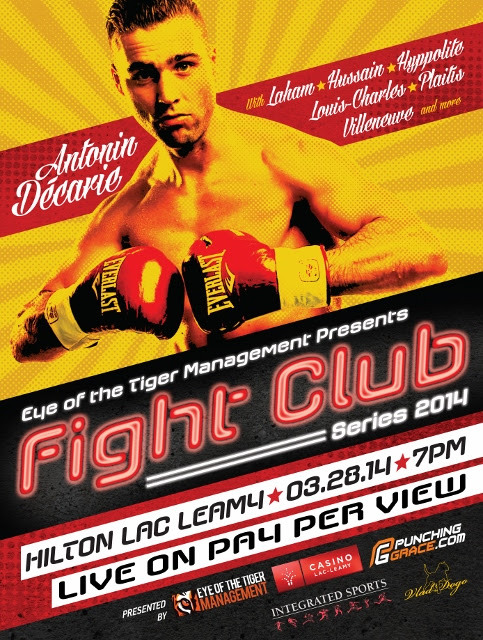 GATINEAU, QUEBEC, Canada – World-rated welterweight Antonin Decarie (29-2, 9 KOs) will headline the seventh installment of the popular Fight Night Series on March 28, airing live on pay per view from Lac Leamy Casino in Gatineau, Ontario, Canada. Fight Club Series, presented by Eye of the Tiger Management (EOTTM), is being distributed in the United States by Integrated Sports Media for live viewing at 7:00 p.m. ET – 4:00 p.m. PT on bothcable and satellite pay-per-view via DIRECTV, iN Demand, DISH, and Avail-TVN. The event may also be watched worldwide on PPV at www.PunchingGrace.com. “We’re very excited to market Punching Grace and our fighters to 70-million potential households in the United States on all major cable and satellite outlets,” EOTTM president Camille Estephan said. “Our series is old school boxing in an intimate environment. Punching Grace brings real-life boxing to viewers. They’re close to the action in the ring, as well in the back area before and after fights. Decarie, the popular Quebec boxer who is rated No. 9 by the World Boxing Council (WBC), takes on former Mexican welterweight champion Pablo “Sepulturero” Munguia (19-4, 11 KOs) in the 10-round main event. Decarie’s last fight was an impressive second-round stoppage of Cesar Chavez(21-5) this past month. The French-Canadian boxer has won two in a row since he dropped a 10-round decision to Luis Carlos Abregu (34-1, 28 KOs) last April for the vacant WBC Silver Championship. Manguia has won three straight, including a 10-round decision over previously unbeaten Canadian-based Samuel Vargas (15-0-1) last December in Mexico. In the 10-round co-feature, Lebanese-born Montreal super featherweight Baha Laham (12-1-2, 5 KOs) faces southpaw Roody Pierre-Paul (8-1, 5 KOs) for vacant WBC Continental Americas title. The undercard will feature many of Canada’s most exciting prospects including Schiller Hyppolite(8-1, 5 KOs) vs. Georgian super middleweight George Beroshvili (8-1, 5 KOs) in a 10-round bout; lightweight Chris Plaitis (5-0-1) vs. Jesus “Diamante” Perez (4-2, 2 KOs) in a six-round match; super middleweight Pascal Villeneuve (3-0, 2 KOs) vs. Francois “The Tank” Miville (6-1, 2 KOs) and Mitch Louis-Charles (3-1-1, 2 KOs) vs. Guillaume Coude (2-0, 1 KO), cruiserweightSamer Baraket (2-0, 2 KOs) vs. Sandy Pembroke (3-7, 1 KO), and heavyweight Zack Bunce (2-0, 1 KO) vs. Steven Harvey (4-1, 2 KOs) in four-round fights. For further information about Decarie and the Mar. 28, please visit www.eottm.com,www.PunchingGrace.com or www.IntegratedSportsNet.com, or follow on Twitter @eotmvd, @DecarieBoxing and @IntegratedPPV.